If you’ve not yet used my6sense then the first thing that you need to do is read our initial review from when it came to the Android platform. Since then, we’ve kept you up to date as it has added more features to its mobile offerings and we even called it one of our best of 2010. For months, though, we’ve been talking to the folks behind my6sense about the need to bring its digital intuition to the browser in order to make Twitter a more relevant experience. Today, our wait and yours is over. 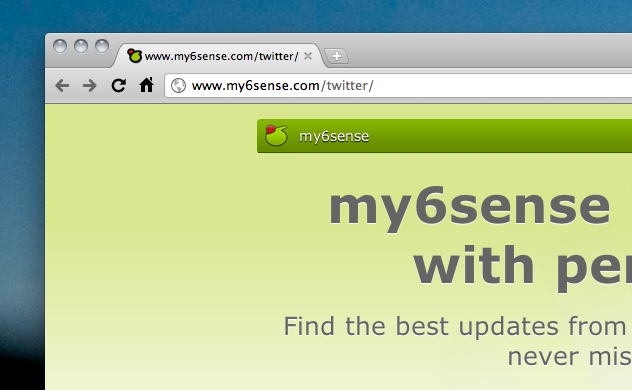 For those of you using Google Chrome, you can now download my6sense for Twitter.com. If you thought that New Twitter was amazing, wait until you see how my6sense makes it even better. First, because it’s my6sense, it provides you with another tab along the top. Instead of just Timeline, Mentions and the rest, you now have a my6sense filter. The more you read and click on Twitter.com, the more that my6sense gets to know you. The app will then filter your my6sense timeline inside of Twitter to show you a display that’s much more akin to “top tweets” based on your interest. The next great feature is that you have previews in the right pane of Twitter.com. If someone tweets a link and you highlight their tweet, you’ll see the content of the link along the right. It’s very similar to what we loved about Lazyscope and it’s incredibly handy. This is one of those times when I’ll just ask you to trust what we’ve found. my6sense can completely change the way that you view Twitter. While I have to admit that I don’t use it all of the time, I’ve found it to be the best way to sit down and check in first thing in the morning. Think of it as a Priority Inbox for your Twitter stream. The things that you care about get filtered to the top and you can read the rest when you want. We’ve talked time and again about how Twitter needs a way to filter your timeline into a Top Tweets selection. Now, my6sense has done that for Twitter.com and it’s genuinely impressive as to what you’ll see as a result. So stop waiting. Head over to my6sense and grab the new Chrome extension. We can’t wait to read your thoughts. Read next: YCombinator's Convore launches: Simplest group communication tool ever.